Chief Administrative Officer Steve Doherty updated council on the ongoing negotiations at council’s Monday night meeting, saying that he had procured savings for the municipality, but that he still had some concerns. Doherty told council that the municipality stood to pay nearly $118,000 for fire coverage in the north end of the municipality from the Fire Department of North Huron for the coming year. He also said that those costs would stand to increase by two per cent every year of the five-year agreement. This would be a substantial increase, he said, from the $92,000 paid the previous year and both are still highly increased from the average of $40,000 the municipality used to pay per year under the previous agreement, which had been in place before the current five-year agreement was struck. Doherty said that it was the hope of council that after seeing a two-and-a-half-times increase five years ago that costs would stabilize or even perhaps begin to decrease, although that doesn’t seem to be the case. Faced with the potential increase in costs, Doherty encouraged the agreement to be weighted in a different way. He said that because of the increase in property values on farmland, the municipality was seeing increases based on that assessment. In fact, he said, because farmland was increasing in value it didn’t mean that it posed a higher fire risk. He then suggested that costs be portioned out according to current value assessment (CVA), which then changed Central Huron’s costs drastically. Under the new method of determining cost, Central Huron would be on the hook for $97,400 for the first year of a new five-year deal. It is still more than the municipality paid last year, he said, but much closer to that figure and a savings of over $23,000 per year. He also proposed capping the department’s reserves at $100,000, a concept he adapted from the municipality’s agreement with the Goderich Fire Department, which caps its reserves at $80,000. That provision, he said, could save the municipality a further $3,000 per year, bringing Central Huron’s costs for the year down to just over $94,000. 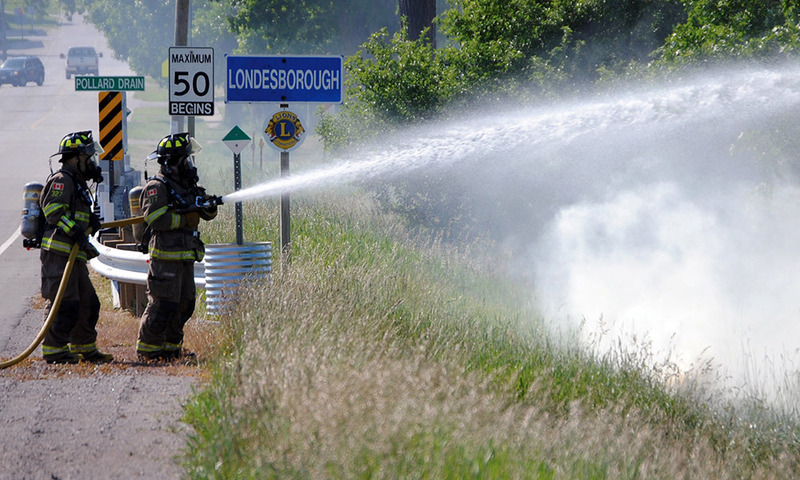 The Fire Department of North Huron said it was in favour of the new five-year contract, provided that the CVA would be reviewed at the end of every year. Doherty said he too was in favour, but suggested that Central Huron then also reserve the right to review its fire boundary lines every year. He said that if the municipality were to adjust its boundaries by a half block along Londesborough Road, for example, it would save the municipality $15,000 per year. If the boundaries moved by a full block along that same stretch of road, the municipality would save $28,000 per year. He said that if that were the case, the municipality would have to pay between $5,000 and $7,000 to the county to readjust the boundaries and redraw the response polygons, but that would be a one-time cost compared to annual savings. Councillor Marg Anderson said that reserving the right to change the municipality’s boundaries every year would be important, especially with the new location of the Blyth fire hall yet to be determined. If the hall is to be located on North Street, as has been proposed, she said, that would not be a good location for Central Huron residents. She suggested that perhaps the boundaries could be adjusted in the event that the hall is located in the north end of the village, because Central Huron firefighters may be able to respond to situations in certain parts of the north end of the municipality faster if the hall is located another kilometre north of where it currently sits. Councillor Alison Lobb asked about the cost jump in the first place and why Central Huron had to pay so much for coverage it received for much less money mere years ago. Doherty said that buying into services of the Fire Department of North Huron meant that the municipality inherited costs for the entire department, including the Wingham hall, despite the fact that it’s North Huron’s only fire coverage partner that doesn’t make use of that hall. He also said there are added services with North Huron firefighters, including fire response skills. Council directed Doherty to approve the newly-negotiated contract with the condition that Central Huron can examine its boundary lines every year.